In 1812, Heinrich Vogel (1778-1867) recognized that glucose was a product of hydrolyzing lactose. 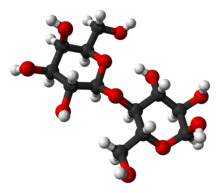 In 1856, Louis Pasteur crystallized the other component of lactose, galactose. By 1894, Emil Fischer had established the configurations of the component sugars. Lactose was named by the French chemist Jean Baptiste André Dumas (1800-1884) in 1843. Lactose is hydrolysed to glucose and galactose, isomerised in alkaline solution to lactulose, and catalytically hydrogenated to the corresponding polyhydric alcohol, lactitol. Lactose monohydrate crystals have a characteristic tomahawk shape that can be observed with a light microscope. Several million tons are produced annually as a by-product of the dairy industry. Whey is made of up 6.5% solids of which 4.8% is lactose that may be purified by crystallisation. Whey or milk plasma is the liquid remaining after milk is curdled and strained, for example in the production of cheese. Lactose makes up about 2–8% of milk by weight. Industrially, lactose is produced from whey permeate – that is whey filtrated for all major proteins. The protein fraction is used in infant nutrition and sport nutrition while the permeate can be evaporated to 60–65% solids and crystallized while cooling . Lactose can also be precipitated from whey using ethanol. Since it is insoluble in ethanol, lactose precipitates, in about 65% yield. Infant mammals nurse on their mothers to drink milk, which is rich in lactose. The intestinal villi secrete the enzyme called lactase (β-D-galactosidase) to digest it. This enzyme cleaves the lactose molecule into its two subunits, the simple sugars glucose and galactose, which can be absorbed. Since lactose occurs mostly in milk, in most mammals, the production of lactase gradually decreases with maturity due to a lack of continuing consumption. Food industry applications have markedly increased since the 1960s. For example, its bland flavor has lent to its use as a carrier and stabiliser of aromas and pharmaceutical products. Lactose is not added directly to many foods, because its solubility is less than that of other sugars commonly used in food. Infant formula is a notable exception, where the addition of lactose is necessary to match the composition of human milk. Another major use of lactose is in the pharmaceutical industry. Lactose is added to pills as a filler because of its physical properties, i.e., compressibility, and low price. For similar reasons it can be used to dilute heroin. 1 2 Carper, Steve. "The Really BIG List of Lactose Percentages". Lactose Intolerance Clearinghouse. Retrieved 30 January 2014. Marcellin Berthelot, Chimie organique fondée sur la synthèse [Organic chemistry based on synthesis] (Paris, France: Mallet-Bachelier, 1860), vol. 2, pp. 248-249 and pp. 268-270. ↑ Ling, Charles (2008), Whey to Ethanol: A Biofuel Role for Dairy Cooperatives? (PDF) .